On December 12, 2018, about 1430 Hawaii-Aleutian standard time, a Hawker Hunter MK-58 airplane, N323AX, was destroyed when it impacted open ocean shortly after takeoff from Daniel K Inouye International Airport (HNL), Honolulu, Hawaii. The airline transport pilot was seriously injured after he ejected from the airplane prior to impact. The airplane was registered to Hunter Aviation International and operated by Airborne Tactical Advantage Company (ATAC) as a public aircraft. Visual meteorological conditions prevailed at the time of the accident and an instrument flight rules flight plan was filed for the local flight that departed about 1428. The purpose of the flight was to support adversary and electronic warfare training with U.S. military forces. 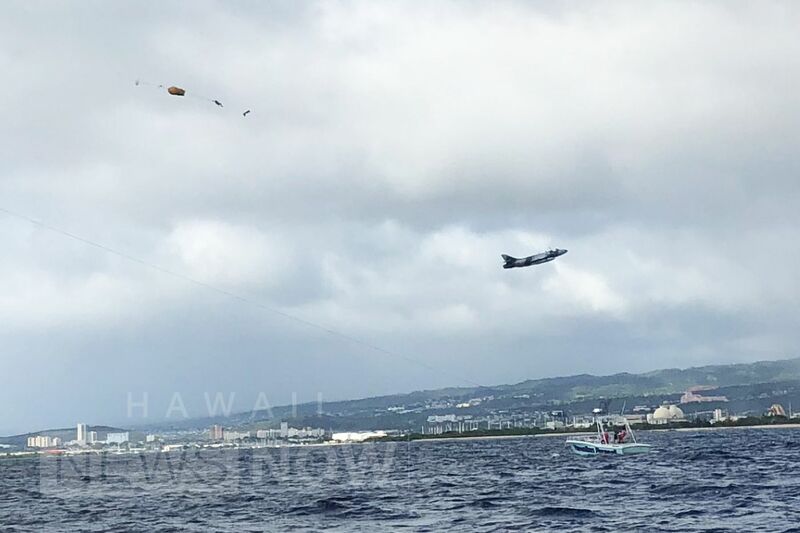 The accident airplane departed as the wingman in a flight of two Hunters, intending to participate in an adversarial support air-to-air training exercise ("Sentry Aloha") off shore in warning areas W-188C, W-189, and W-190. The flight's radio call sign was "ATAC 01," and the accident airplane was "ATAC 02." The pilot reported that during the departure phase of the flight, the engine experienced a loss of power about 500 ft above ground level during the departure turnout. The pilot attempted to restart the engine, but the airspeed continued to decay, at which point he decided to eject. After he ejected from the airplane, the pilot reported that he got one swing in the parachute prior to water entry. The airplane wreckage subsequently sank.